Transparency Market Research delivers the key insights on the container glass market in its published report, titled “Container Glass Market: Global Industry Analysis and Opportunity Assessment, 2018–2026”. In terms of revenue, the global container glass market is estimated to expand at a CAGR of 5.0% during the forecast period, owing to numerous factors, about which TMR offers thorough insights and forecast in this report. The U.S. is not only the largest market for pharmaceuticals and leading in terms of pharmaceutical research & development expenditure, but also one of the leading producer of pharmaceuticals in the world. As container glass is highly preferred for packaging of pharmaceuticals, the large pharmaceutical industry of the U.S. is one of the primary drivers of container glass market in the North America region. The research & development on pharmaceuticals has also led to a large variety of container glass materials and packaging solutions. Sub-Sahara African countries in the MEA region are estimated to account for around 40% of the MEA container glass market in terms of volume in 2018. This is prominently due to the large production of beer and other alcoholic beverages in the region which is further projected to witness a rise during the forecast period. Moreover, the pharmaceutical industry of GCC countries is rapidly growing. Among individual countries of the MEA region, South Africa is estimated to hold the highest market share, followed by Turkey. The significant presence of packaging companies in South Africa is majorly responsible for its dominance in the MEA region. The cost of manufacturing of container glass in Europe is relatively high, primarily due to high labour costs in the region. On the other hand, the manufacturing cost of container glass is significantly low in the Asia Pacific region. The Asia Pacific region accounts for the highest demand for packaging in the world, which lead to the highest demand for container glass in the region in terms of volume. 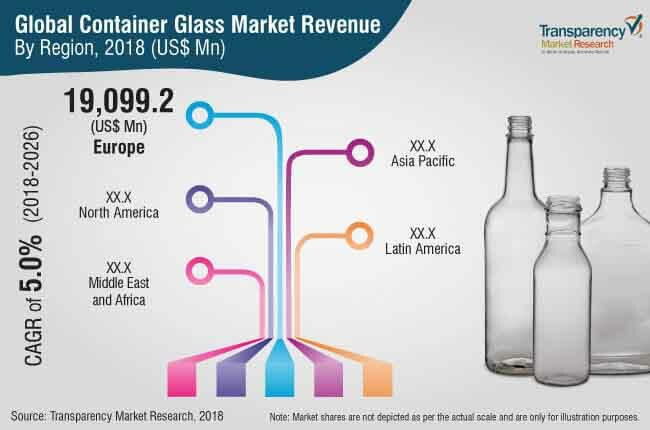 Thus, the Asia Pacific region is dominating the global container glass market in terms of volume, while the economic availability of container glass in the region has resulted into a low container glass market volume share as compared to that of the Europe region. Majority of the demand for container glass in the Asia Pacific region is served by the relatively unorganised manufacturing industry established in the region which provides container glass at economic prices to compete with the global container glass market leaders operating in the region and target low out-put end-users. Europe was the largest exporter of container glass in 2017, as well as the importer, in terms of value. The Asia Pacific was the largest net exporter of container glass, while Latin America is also one of the net exporters of container glass. On the other hand, MEA and North America geographic segments were the net importers of container glass in 2017, and North America was the largest net importer in terms of value. Although the overall manufacturing sector of the Latin America region has shown almost no growth in the last few years, the beverage industry in the region is developing at a significant pace. This is due to the increasing demand for packaged beverages, alcoholic as well as non-alcoholic, among the consumers in the emerging countries of the geography. Globally, leading beverage companies such as Coca-Cola Company are making efforts to expand business in the region, in turn, creating a lucrative opportunity for the container glass market.